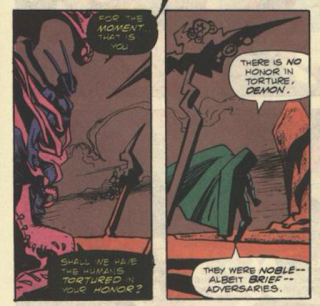 Differentiating it from Immortus' timeless Limbo (where Space Phantoms and Dire Wraiths go), Dr. Doom refers to Limbo as "Otherplace", which is, I think, the first use of that term to describe Belasco's/Illyana's Limbo. I find it hard to believe Scott Lobdell coined that term in a fill-in run and it stuck, but I can't recall it being used prior to this issue, and the internet is being less than helpful in confirming if this is it's first usage. If anyone knows either way, sound off in the comments. Darkoth, an old Fantastic Four villain with ties to Dr. Doom, pops up in Limbo in this issue, and will continue on into the next. Quicksilver is amongst the Avengers appearing this issue, notable simply because in a few months he'll become a regular fixture of the X-books in X-Factor. He also displays some legitimately funny snark. As has been the case in the past, it's noted that Limbo changes to reflect its current ruler, which accounts for the demons taking the form of Marvel Universe characters. 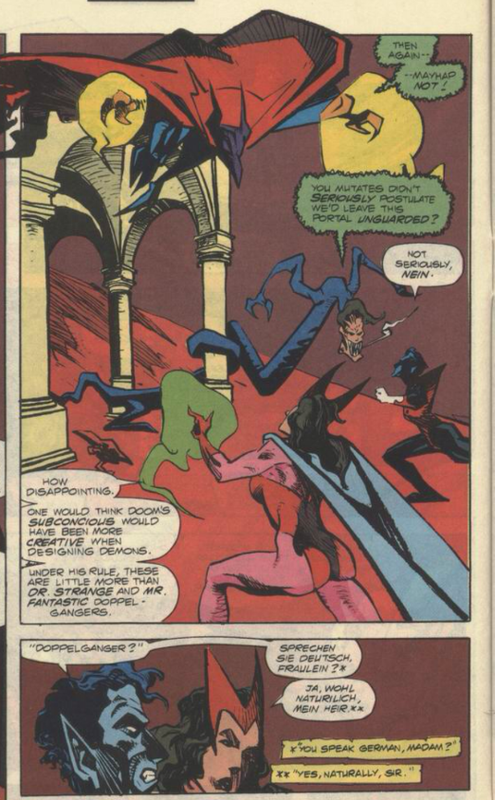 Nightcrawler and Scarlet Witch speak German together (reasonably accurately, though a lot of Scarlet Witch's words are misspelled and at one point she says "that tastes good" when I think she means "that would please me". Also "doppelganger" is hardly a word whose usage would make me think the speaker knows German). 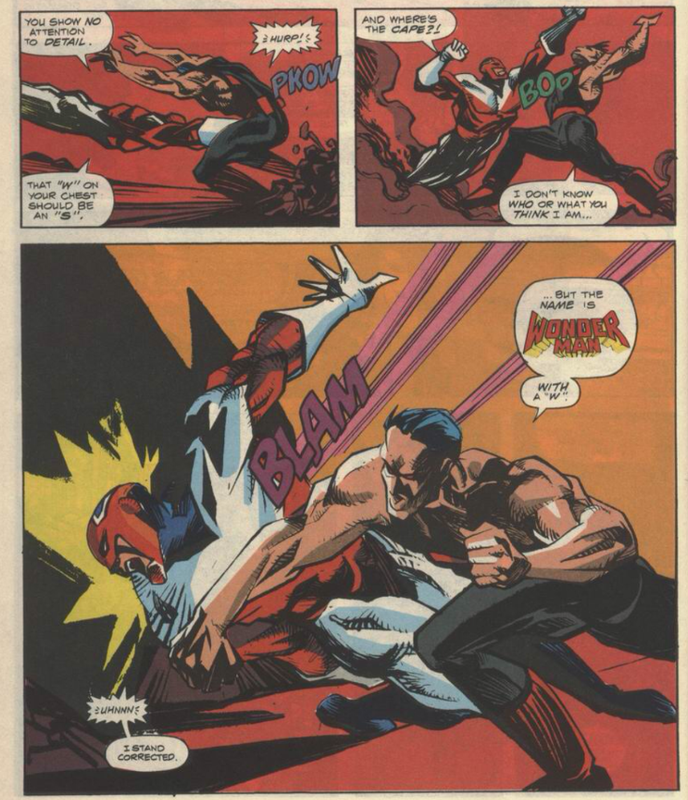 Captain Britain seems to think that Wonder Man is a Superman knock-off. As mentioned in the review of She-Hulk #26, Excalibur in this era seems to be the de facto X-team of choice when it comes to guest appearances in other titles. For similar reasons, it is also the rare X-book at this time to routinely host non-X-related guest stars in its pages: Dr. 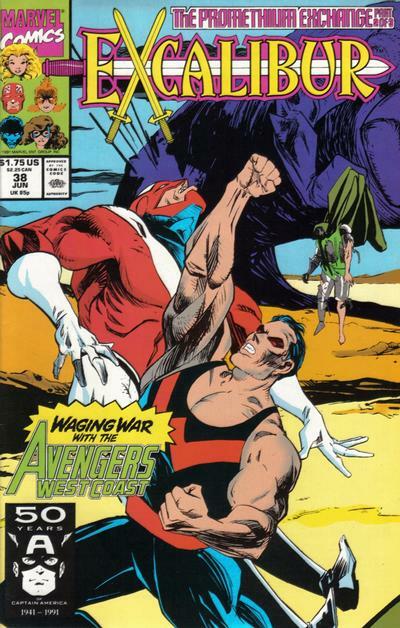 Strange in #30, the Outlaws in #36, and now the Avengers West Coast. 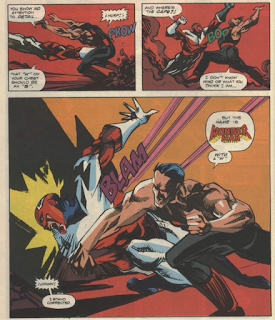 Outside the merits of the individual stories, these guest appearances at the very least help shore up the idea of Excalibur as a legitimate superhero team, and not just a collection of assorted X-Men castoffs (even if the appearances, as in the case of the Avengers here, are pretty random). For a series desperately in need of an identity, "token guest star vehicle" maybe isn't the greatest identity, but it's an identity. As for this issue, it works as an effective team-up issue, doing the usual misunderstanding fight before breaking the two teams up into pairs (shades of New Warriors Annual #1), and there's some fun in seeing Quicksilver, on the verge of getting drafted more tightly into the X-universe, interacting with Excalibur as an Avenger. Granted, the art is still not very good. Some of the more Sienkiewiczian surrealism works better here than in the previous issue, with more of it set in Limbo, but for the most part, it's a mess, with hard-to-follow storytelling that isn't helped by the quality of the paper at this time (which is, I believe, still better than the average comic, but the art doesn't hold up as well on it). Lobdell's story continues to work as an innocuous team-up featuring a classic Marvel baddie, but the art also continues to drag it down. Tomorrow, Wolverine fights Robo-Wolverine in Wolverine #40. 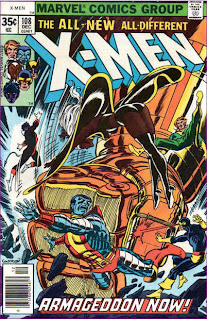 Next week, Uncanny X-Men #278 and the conclusion of this story in Excalibur #39. "Dr. Doom refers to Limbo as "Otherplace", which is, I think, the first use of that term to describe Belasco's/Illyana's Limbo"
Has anyone ever referred to it as that? It seems like the majority of people still call it Limbo. Even now, in the current X-books, I think they still do call it that. I have to admit, the pre-Solo Davis Lobdell run isn't that bad. It isn't the most memorable stuff this series has given us, but it does seem to hold up better than some of the stuff we get with Lobdell later on in the run. And it does help his run comes after a period of directionless fill-ins, whereas the next batch of issue he gives are during Davis' run and after. I'm pretty sure "Otherplace" gets used again, later. In this series, I think, as well as the limited series that installs Amanda as the ruler of Limbo (before they decided to bring Illyana back for good), though I can't remember offhand what it's called. I got a hang-up myself with exactly the same thing, but then I thought that maybe she pronounces it the correct way and that's what catches Kurt's ear. Also, I do not know for a fact, but it is possible that the Germans would use the phrase "that tastes good" as an idiom for being down with something, like for example I in my local lingo would say "don't matter" when I in fact mean "I find myself in perfect agreement with your proposal, my good man, let us proceed." As our editor-translator once stated on the letter col, "translating is creative work and not some machinary business"... and that's probably why his translated title for UXM #220, "Unfinished Business", turns into "Fish Creditor" if you try to counter-engineer it with Google Translate. Marvel Universe seems to have had a German-speaking enclave in the Latveria-Transia area which the real-world Serbia-Romania border never got around developing. I've never encountered that as an idiom myself, though my study of German is far from comprehensive - despite minoring in it in college, I've never considered myself fluent. That's certainly true. It's one of the things I find most fascinating about languages. Pssst... Your post header says #39 but this is #38. Thanks. Apparently I wrote the entry in the "move one issue ahead" template instead of the present post, and never noticed.